A cold, damp spring weekend (perfect!) 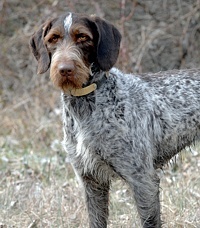 for this all-breed pointing dog hunt test. We got a few shots in between other activities at the event. A cold grey morning, but these two handlers are looking forward to their runs. Since we're in the gallery, and it's sleeting and snowing, and we're waiting for the judges, let's amuse the dogs with some portraiture. Pointing dogs often pose well - perhaps it's actually related to their pointing and honoring urges. Now, a bit more snow kicks in. Spring in Pennsylvania. 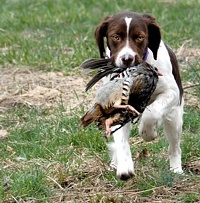 Di, a young Brittany pup, is hot on the trail of a recently deceased chukar partridge that's been placed in the cover behind the club house. She gets it, Di does. 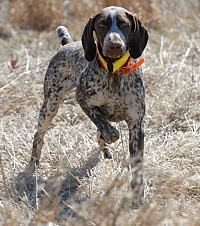 And in a flurry of old weeds, mom tosses the chukar off in a simulated flush. One more time. 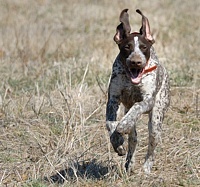 That chukar body's a bit too big for a pup's mouth, but that's a sturdy wing joint. 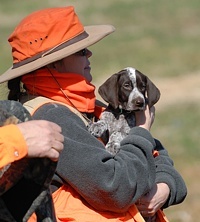 A German Shorthair, anxious to get going on the Junior Hunter course. Ed and Moxie heading back from the Junior course. Veteran judge Mike (left) and his intrepid apprentice. Her good side? They're all good. Good girl. Thanks for indulging the photographer. Dennis and one of his charges head for the Junior break-away. Two handlers and their dogs spend a moment together on the line before the judges send them off onto the Junior back course. 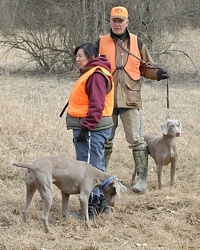 In the Junior test's bird field, the two handlers try to keep their dogs working different areas of the field. One judge watches each dog. Working the treeline that borders the Junior bird field. Hunting instincts kicking in at a hunt test: staying close to the woodlines into which the quail have been flushing all day. 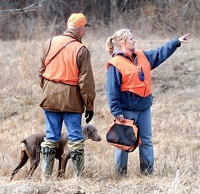 Dennis pays attention to some pointers from Kristen, but that Weim only has eyes for those two quail, inches away in her bird bag. Running a by-dog to fill out a Junior brace. 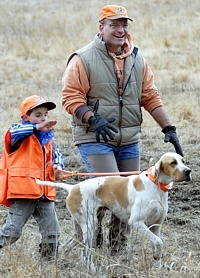 An unusual father-son handling team are running a Pointer on the Junior course. 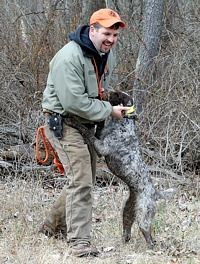 Here, the Junior dog and the Junior Handler or working on casting off. Another bit of play-by-play from Dad. 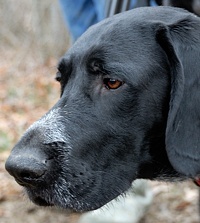 Heading into the thicket to flush a quail in front of his staunch Pointer. A good flush! Everyone is pleased, except perhaps the quail. A great run. Much was learned, all around. The secret hand signs of the Brotherhood Of The Pointer Handlers. Another find on the trail back from the Junior course. 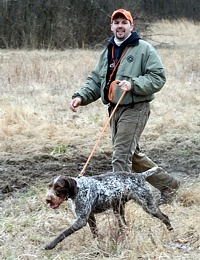 With both dogs simultaneously pointing the same bird, gunners and both handlers quickly approach the situaion. The judges will rule on which dog should work the bird. A classic hunt test flush. 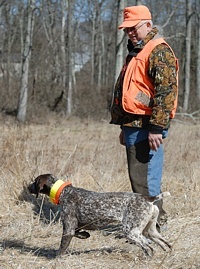 The dog watches as the bird goes up, the handler swings his prop gun (per the rules), and the two gunners he's placed at either side make sure the bird is retrievable. 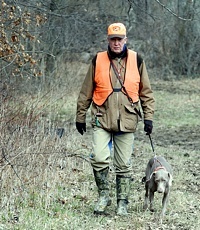 With the bird away, and trusting the gunners, this handler is looking back to his Weim to make sure he's steady. And again, on his next find. 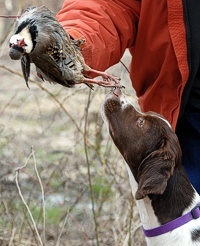 The dog takes on a subtle cautionary gesture from the handler while the guns take care of knocking the bird down. 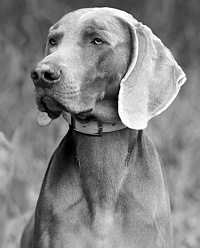 The Weimaraner's reward for showing such steadiness is a chance to do a nice retrieve. The gunners turn their backs to the dog so that it's clear to whom that bird should be delivered. A two-month-old Shorthair pup takes in the sights and sounds. We spend a few minutes with Lynn Fair as he works with a stellar new addition to Team Buck Hollow. She still has those puppy-ish curves and an evolving build. Pointing beautifully. â€¦ and stretching it out. You'd squint some too, going through the weeds at that speed. A look at some rear joints movement . . .
. . . and the front end. A nice way to wrap up the morning.